If the sheer style of this idea - a punk take on Edgar Allan Poe - doesn't seduce you, I'm not sure what will, but I'm game to give it a go. The punk in the title is all things writerpunk - be it steampunk, cyberpunk... alas no unicornpunk*, but one can't have everything! The collection features a number of writers, all contributing their take on the works of Poe. Bookended by very different takes on the Fall of the House of Usher, we stop off at variations on The Raven, The Masque of the Red Death, The Facts In The Case of M. Valdemar, The Telltale Heart and more. Stories are given a new spin with clear love and affection from the writers - just take a read of Carol Gyzander's Clockwork Raven to see the careful attention to detail in the updated tale. The opener, by Jenny Blenk, is also a fine example. A cyberpunk vision of the Fall of the House of Usher, where nanomachines and failed software integration is undermining the home of the Ushers and, as the story unfolds, it appears the Ushers themselves. Splendidly done and with a real urgency to the tale that gives a freshness to the familiar. Andrea Hintz's take on the Telltale Heart, Ticker, also gives a vibrant update to an old tale, with the tick-tock urgency of the would-be cyber-modder clearly locked in the grip of madness. Elsewhere we have the therapy sessions of M.Valdemar, brought to life by David Stegora, or the jaunty Search for Eldorado, by Rie Sheridan Rose, a short but sweet piece of poetry that deserves to be turned into a steampunk convention drinking song! Also short, but making me wish it was longer, was Jeffrey Cook's Red Sky At Morning. Splendid writing, but feels like it all came to an end a bit too quickly, just as I was getting settled into the tale. There is the gruesome - such as Anthony Stark's 32 Ways To De-Objectify Your Lover or Voss Foster's Ivory - and the darkly, quirkily fun, such as Virginia Carraway Stark's delightful and mischievous King Pest. Tabula Rasa, by Jayelle King, also deserves a nod for its neat exploration of someone trying to pry open their past after a memory wipe. I can't pick a single favourite from the collection, but I adored the richness of two stories. In Nils Nisse Visser's The Oval Sky Room, a girl born to poverty finds the possibility of salvation in posing as a model for a rich artist in his skyborne airship home... but dangers lie ahead. This tale was so neatly written that the pain of the finale cuts deep - beautifully done. The other standout tale for me was Holly Gonzalez's The Envy of Angels, who goes beyond a simple update of a Poe tale to create a whole cyber-influenced world in which one young man's singing voice first comes to offer hope... and then poses a threat to the foundations of the world as so-called angels stalk the Earth once more, with devastating consequences. 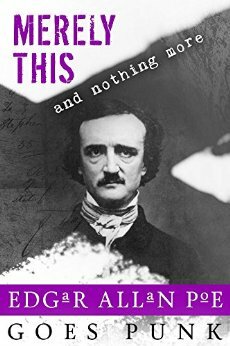 If you love Poe and you love punk, then buying this is a no-brainer, it's a great read. Plug in your neural jack and download this, you will regret it... nevermore. *Unicornpunk may not actually be a thing. Merely This And Nothing More is available on Amazon here. Thanks for the wonderful review! Reviewers like you make everything worthwhile!!! Hey, books like this make reviewing worthwhile! Smashing read.